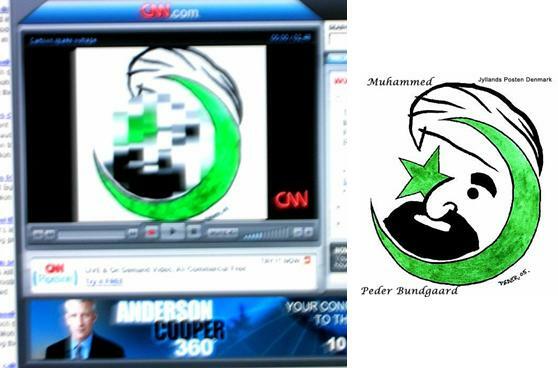 CNN & FOX News Show Danish Cartoons! CNN has chosen to not show the cartoons in respect for Islam. CNN is not showing the negative caricatures of the likeness of Prophet Mohammed because the network believes its role is to cover the events surrounding the publication of the cartoons while not unnecessarily adding fuel to the controversy itself. As I thought about it, I remembered seeing the cartoon images on CNN this past weekend. 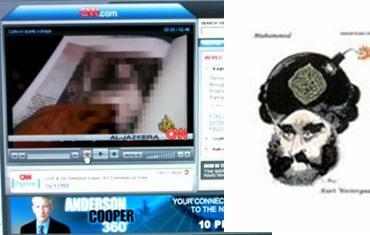 So today I did a bit of searching and found the images in this VIDEO CLIP HERE played on CNN earlier in the week. CNN took part of the footage from their sister station(?) Aljazeera news channel. You may notice there is something odd about the image from the video clip compared to the original next to it. That is really sad and strange! It’s not like Aljazeera has ever worried too much about offending viewers, American viewers, anyway. And, CNN grows closer to being the People Magazine of network news every day. Here is CNN’s contact page (via Michelle Malkin) to write them if you think they ought to adjust thier cameras. Sandmonkey has an incredible story today.